Up until 1st January 2013, video games in Australia were forbidden from using the R18 rating that applies to movies, which meant players down under often missed out on playing titles which contained mature or adult themes. That has now changed, and the first game to be granted the coveted R18 rating is the Wii U bloodbath that is Ninja Gaiden 3: Razor's Edge. It's great to finally see Australian adults have access to video games designed specifically for mature audiences, after more than 10 years working with government, families, businesses and the broader community to introduce an R18+ category. 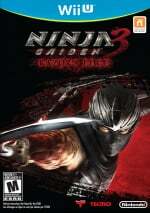 We rather liked the game, as you'll no doubt be aware if you've already read our Ninja Gaiden 3: Razor's Edge review. Are any of our Aussie readers ready to experience R18 content? Let us know by posting a comment. Anyway, great game so go buy it now. From the people who bought you "MAD MAX"! ... and "Crocodile Dundee", so that evens out. Does that mean this is the first version of NG3 to be released down under? @SanderEvers - That's a good point. Does this mean that thanks to German law this game can only be downloaded in the middle of the day in Aus?! again, THERE IS NO SUCH GERMAN LAW. And i can't prove it because, what should i do? Post the non-existing law? If im correct, i STILL need to import it since its not comming to germany at all, am i right ? No shop except my "trusted importer" has this game listed. it just won't be released in Germany, that's it. Nothing illegal about importing. Nobody prevented this game from beeing released here. The PS3 and 360 Version (you know, the original versions) were released. Uncut. If somebody is to blame then it's Nintendo/ or whoever is the publisher. Nothing to do with German laws. And no, Germany is not the new Australia. We had an 18 rating since the start. In fact it's more and more likely that games will be officialy here. And in fact, all Censorship in games were made by the publisher independently IF they thought it would be necessery. There are no guidelines for what a game must have or shouldn't have to get a rating. The game as a whole is considered. So for example Spec Ops: The Line got an 18 rating without a problem because of the topic. It showed war as a cruel thing. So there wasn't a problem with this. But hey, nobody will ever look up German laws, It's easy to say Germany is teh evil. So much more fun. No wonder Austrailia censors children's television so much. Kinda cool that the first mature game in Australia is on a Nintendo console. Even without the R18+ rating the game would have come out here in Australia. It would have had an MA15+ rating. This just means that the game cannot be sold to anyone under 18... finally. BTW: It seems it won't be released in Germany. Reasons unknown. Maybe because Nintendo is the publisher ( is Nintendo the publisher in Europe?) and doesn't want to publish such games over here? That's my guess. Because, you know, the situation depending violent games is getting better over here in recent times. Dudes, what*s going on? I really expected some ,,oh those Krazy Germanz'' Comments. And what do i see? Nothing. I am really impressed. Ah, OK. Would have been kind of nice for you guys to have another system exclusive! Nobody said Germany's evil. That's a ridiculous allegation. And about time as well! Nice one Australian developers, gamers and consumers. You finally won this well deserved victory. I have been looking forward to this for years. It's great for us Australian gamers who are adults. I may actually buy Ninja Gaiden just to say I own the first R-Rated game in Australia. Unfortunately there is still no official release date despite the game bieng classified. I heard it is releasing March over here. Which is crazy, everyone will be playing Rayman Legends, Aliens: CM, Dead Space 3, & Bioshock Infinite. It should be out in Aus now!! I love that the first R rated game for Australia is not only on the Wii U, but actually PUBLISHED by Nintendo of Australia aswell! I'm going to find out when it comes out whether we'll be affected by whatever the future German law does to Europe.